My mom came over last night for a little birthday celebration after her quilting group. 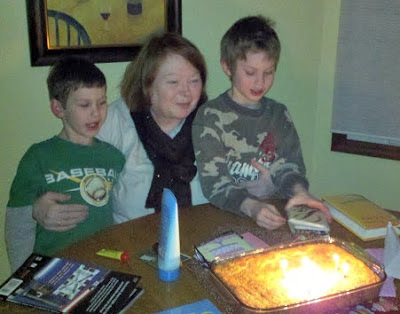 The boys were so anxious for her, and my Aunt to arrive that they even offered to vacuum the house while I made the cake and wrapped her gifts. Works for me! Greyson picked out two gifts for his Nana a couple of weeks ago and wanted to spend his own money on them. He got her some cute reading glasses and some coasters for her living room. Since she's headed for a little R&R in Florida to see my Grandpa, Owen and I got her a B&N gift card and a sweet treat. My Aunt packed up some sunscreen for her Florida trip too! The cake was a new recipe for me keeping in mind her recent heart surgery and our 10-day pledge. Homemade angle food with organic pineapple and homemade whipping cream with honey instead of sugar. I had to call my mother-in-law to figure out how to make the whipping cream! Thank you Tweet Tweet! 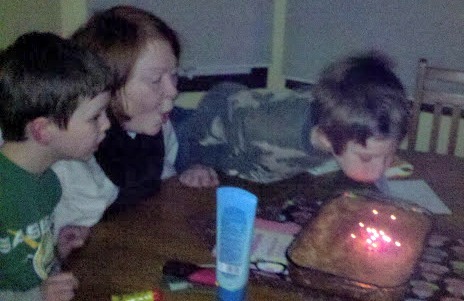 Greyson added a ton of candles to the cake and I attempted to get a decent picture in the dark with my phone. Not so great, but documented nonetheless. Happy Birthday to Mama! She is looking healthy and well rested! If you are what you eat, then I am a cookie!! A girl scout cookie, to be precise! Aw what fun! Sweet pictures.